DURHAM, NC – On Tuesday, Sept. 11, Hurricane Florence sat lurking off the Atlantic coast. Carolinians, both North and South, were weighing their options. Should they evacuate? Should they stay and try to weather the storm? More importantly, how could they stay, with food staples and precious water already cleared from store shelves? Fullsteam Brewery has about 25,000 likes on Facebook, so the message was seen (and liked, by more than 1,300 followers). The brewery’s website states that their mission is to craft distinctly Southern beer that celebrates the farm and food traditions of the American South, and hospitality has long been known as a tenet of Southern culture. 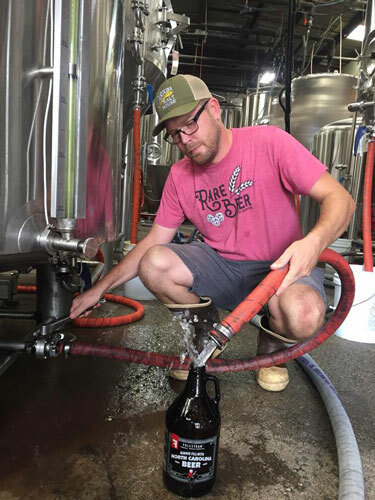 “Our passion at Fullsteam is to connect people to the land and to one another,” Wilson said. “Typically, we think of that in terms of building community, foraging for ingredients or supporting local farms. But when natural (or unnatural) disasters strike, it’s our responsibility to give back to the community…to the people who support us. The idea to provide the water came from Head Brewer Chais McCurry, according to Wilson. North Carolina Governor Roy Cooper told North Carolina residents, “Don’t bet your life on riding out a monster.” Fullsteam Brewery couldn’t slay the dragon…but they could slake the thirst of those who were trying to survive the storm.